Having just written on the so-far successful double-arm transplant that promises so much to Gabriel Granados, I should point out a genuinely troubling problem with services to the handicapped here in Mexico. Family and Social Services (DIF… Desarrolo Integral de la Familia) programs, at the Federal, State, and Municipal level are charged with providing services for special needs citizens. While meant to work in conjunction with IMSS (the Mexican Social Security Institute, which is also the national health care system), too often DIF is seen more as a charity… or a PR oppportunity… than as a public service. Especially at the local and state level, there’s been a long-standing custom of appointing the wife of the municipal president or governor to head the DIF — creating the impression that DIF is a charity group for the ladies who lunch… of the right political party. While that is a good reason in itself to vote for more presidentas and gobernadoras, and some state’s “primara damas” are surprisingly professional, DIF is all too often under amateur administration… or worse, turned over to party hacks. It’s very nice that the Governor’s wife shows up at a party for children with Downs’ Syndrome, and Party leaders are always grateful when someone manages to get some story like “Mayor Provides Funds For New Wheelchairs” (although, in a recent scandal here in Sinaloa, the difference between the budgeted cost and the for real wheelchairs and the plastic chairs with bicycle wheels that were delivered raised some eyebrows… and never was explained), but there is also the tendency to use DIF to push political agendas. The DIF employees are generally hard-working and committed, and do more than they are asked, but when their administrators don’t provide funding for services to persons with AIDS, or the less photogenic (or sympathic) persons in need of services (convicts, schizophrenics, addicts) there isn’t much they can do, except refer the client to private charities. While there are those charitable organizations that you barely hear about better equipped to deal with some issues that DIF can’t handle (referring an addict to the nearest Narcotics Anonymous meeting makes more sense than most things a government agency could do and social workers at DIF aren’t adverse to calling on the Lions Clubs or the Rotary or the Sisters of Charity when they need them), one charity in particular has become a polemical issue, not only for duplicating the work of DIF, but in a real sense, a competitor to it. The Televisa “Teletón” is pushed by everyone from the President of the Republic (whose wife, conveniently, was a telenovela star in any number of Televisa productions), the main political elites, and … Televisa having a stranglehold on popular entertainment, of course, every popular singer, dancer, actor and celebrity of note. In addition to letting the pols show their “concern”, it also is a wonderful opportunity for major businesses to deduct up to seven percent of their pre-tax earnings as “charitable contributions”… while receiving several hours of free advertising on 80 percent of Mexican televisions… and stamping their logo all over all kinds of bling meant for… “handicapped CHILDREN”. Everybody likes children, especially the photogenic, but unfortunate ones, but DIF is meant to serve adults and non-photogentic children as well. Because the Teletón is such a major event (last figure I saw, it had raised about 475 million pesos, and it’s not over until tomorrow night), it is seen by the administration as a substitute for DIF, the budget is often stinted, and seen as a “nice, but less necessary” item … leading to protests by “minusvalidos” of the various Latin American television networks (not just Televisa, although it’s the largest) that put on these events. 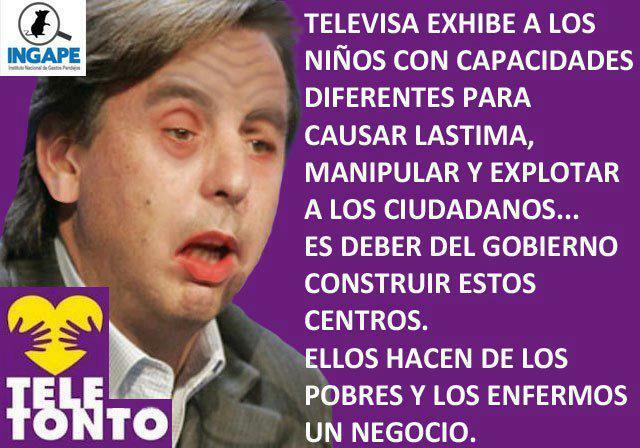 Televisa CEO Emilio Azcárraga Jean from an anti-Teletón poster. Secondly, and probably of less immediate impact on DIF, the Teletón is very much a political event… the network (besides taking huge tax breaks for producing the three day special, and… some say… turning a profit providing services to DIF) guarantees the support of the main parties through a simple quid pro quo agreement… be part of the Teletón and go along with it, or receive bad coverage — or no coverage. When it comes to DIF, it’s almost never covered (except when, say, a primara doña needs a photo op) while Televisa gives the impression that it is the main source of assistance for the handicapped. Which it isn’t, and isn’t meant to be. While Televisa’s strangle-hold on Mexican television and news coverage is, itself, an issue, it may seem strange to outsiders that a charity event is boycotted by many and the subject of speculation about hidden motives. 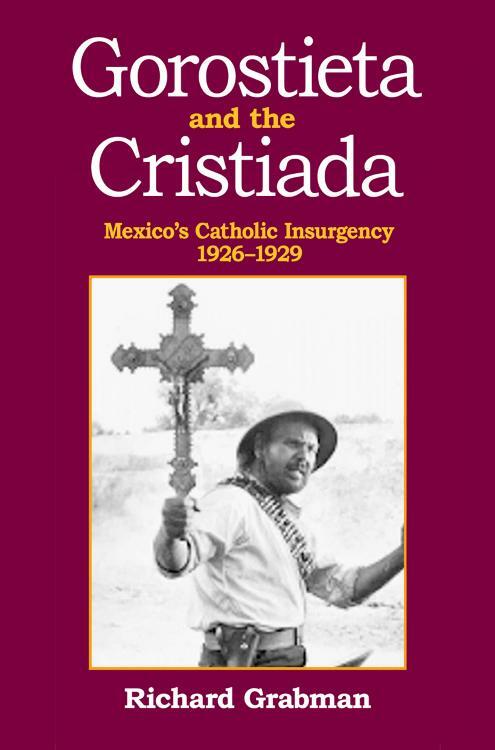 But it does show that Mexicans still have respect for some of their government’s institutions, and understand very well that the State cannot outsource its responsibilities to the citizens without compromising its own commitment to its people. 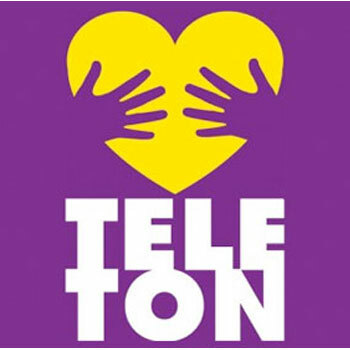 Next october 30, 2014, first CRIT from Teleton USA will be open in San Antonio, TX. Right now, there are 21 CRIT centers in Mexico, a oncological children hospital and an autism center. More than 40.000 children with disabilities are being treated in Mexico in a world wide leading institution in children rehabilitation. Fundación Teletón has absolutely no relation with Televisa. The annual fund raising event is broadcasted by televisa, and tv host, personalities and artist from all over the world appear on the event for free, including many of them that work in Televisa’s competitors. How else is it possible to see them hosting on the fund raising event? Teletón is part or ORITEL, and it is present in 13 different countries. In all of them giving medical care and rehabilitation for disabled children for a tiny fraction of the real medical cost and, in many cases, absolutely for free. 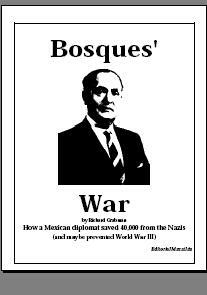 You should be informed before spitting so much nonsense based only on diabolic conspiracy myths. First, visit teleton.org (you can visit teletonusa.org too) so you can see that all you think and say is completely false and defamatory. Then go visit one of the TWENTY ONE CENTERS that are completely stablished in Mexico. Hey, you have a great opportunity to eat your words and retract! Better this way, that having a child with a disability and finding that Teletón is the only good place that offers help without seeking profit. Mexico or the USA. Disabilities has no nationalities.